Stockreversalspremium.com a Swing Trade and Forecast Advisory service. 77% success rate on trades since September 2013 inception. TippingPointStocks.com a Long Term growth stock advisory service aiming for 50-200% gains per position! Just launched October 4th 2017! Join now at Charter Member Rates! Only 60 Memberships Remain of 200 Maximum! If not yet a Free Member of Stockreversals.com , opt in here with name and email to get timely reports every week! After a long near two year rally, we are close to or at Elliott Wave pattern pivot highs we think. 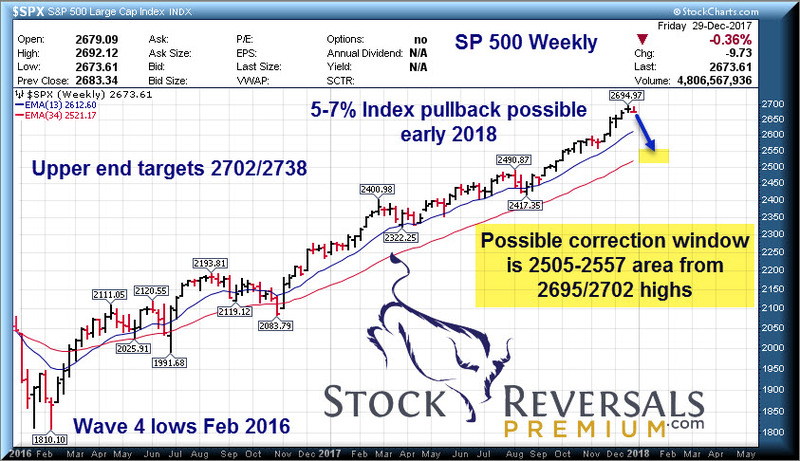 We have been looking at 2702 and 2738 as targets now for many week for the SP 500 to top out. The high so far 2695 is within a breath or so of 2702. We had an 8 day consolidation going into Friday and then instead of an upward breakout we saw selling to end the year. Loosely we are looking for a 5-7% correction in the SP 500 Index which is the main area we forecast. This would take the index to about 2505-2557 areas in the weeks ahead, with a possible stretch to 2702 first. In any event, it would seem that with some postponed tax selling and the huge run up we have had that a pullback is long overdue. Gold is turning up cyclically. In the past few weeks we were forecasting 1268 and 1288 for upside rally targets, both of which were hit. This past week we updated for a rally to 1314, we hit 1310 area on Friday. 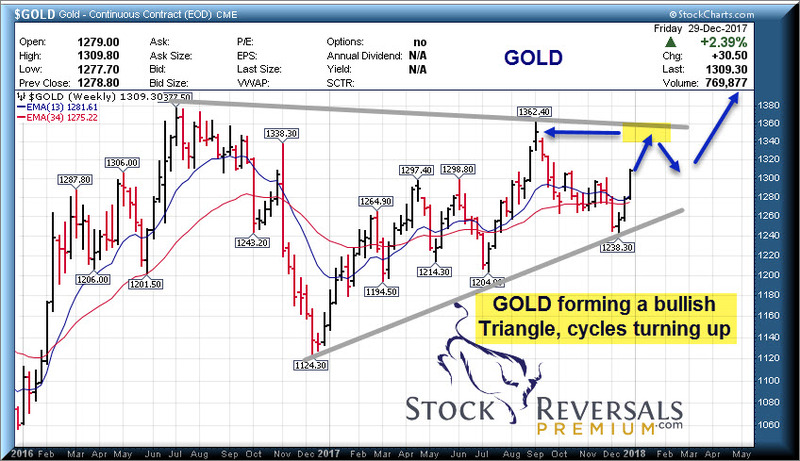 Further out, this appears to be forming a consolidating triangle as we show in our chart. 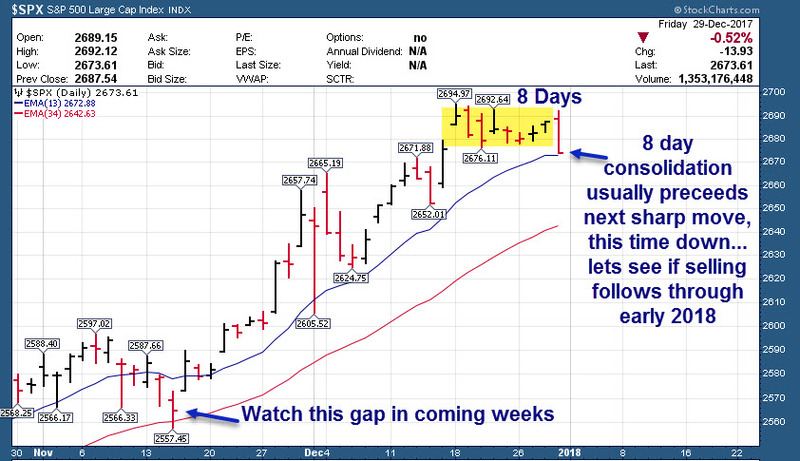 A rally up to the gap area in the chart seems likely in the coming few months. Have you looked into our TippingPointStocks.com Growth Stock Service? 121% Gain already!! For a limited time you can join under with $500 off using our discounted Charter Member Rate while still available. A long term growth stock service aiming for 50-200% gains on each position with an active long term portfolio. We aim for 15 stocks eventually and currently have 6. One of which is up 121% and another is up 55% . Read up and consider joining! We have 60 memberships left of 200 maximum, they will be sold out within a few months we think if not sooner. Bitcoin we think can drop to 9300-9400 on this corrective pattern off the Parabolic move to near 20,000. The Coin offerings and various crypto coins remind us of the 1999 .com bubble, especially the sudden names changes for small companies to incorporate “Blockchain” to juice their share prices. This is very early .com ish. Bulls in Investment Advisory Surveys are at 64% vs only 15% Bears, a 30 year high. This again another contrary topping sign. NYSE 161 new highs and only 9 new lows on Friday. SFM- 5 Week ascending base pattern, 256 Super markets specializing in Organic foods.